Would you like to be notified when commissions will be open? Sign up for my mailing list. Patrons on Patreon are considered first for all commissions. Are there any details the refs don't cover? All pricing posted is only a guideline, and may increase depending on the complexity of the piece. The actual quote for your idea is under my discretion. When I open for full color commissions, spaces are limited and the projects I accept are not first-come-first-served. I will accept applications with a description of the concept, and choose which projects I want to work on. The reason for this is that, due to my full time job, I do not have a lot of spare time to work on art. The best way I can keep enjoying and doing quality work on commissions is to only work on the concepts I am strongly interested in! This does not apply to smaller commissions such as badges and sketches, which are available at cons and throughout the year between my larger projects. These are also limited, but are first-come-first-served and generally available more often. I do not keep waitlists. A preview sketch will be provided for approval for full color commissions, and payment is not due until the sketch is approved (a deposit may be required prior to the sketch stage). Payment must be made in full before work can continue beyond sketch stage. 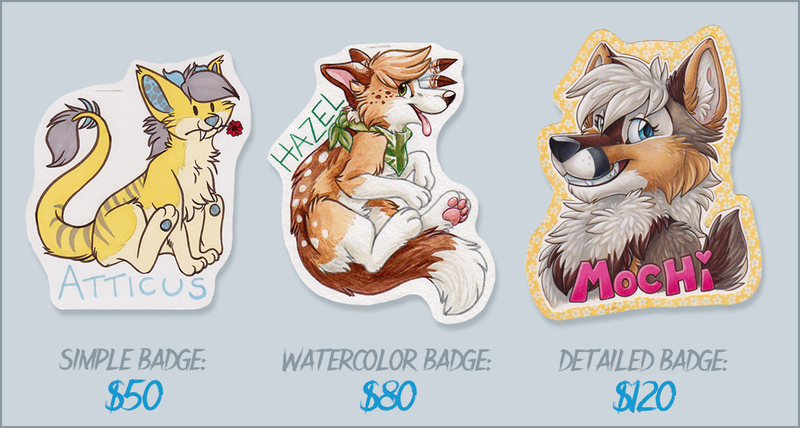 Payment for badges and sketches must be made in full before any work can begin. No preview sketch will be sent for approval on smaller works such as these. Once the final artwork has been provided, you may request small changes if something is not quite to your liking. There will be no charge for the first round of changes unless they are unreasonably large, or involve something integral that was not specified in the initial description. All changes after the first round will be charged for. Limitations and pricing for this are under my discretion. All artwork obtained from me, the artist, is under my copyright. Nobody other than myself may print, publish, distribute or sell copies of my work unless a written agreement has been signed by myself and the purchaser. Note that purchasing the copyright to my work will incur a higher charge. I maintain the right to make and sell prints of commissioned artworks. Sign up to receive email updates when commissions become available!